Turpentine Oil is a volatile oil obtained from pine resin, which is scientifically known as Pinus palustris belongs to Pinaceae family. Pines are evergreen coniferous species native to many parts of Central and North America, Europe and Asia and also in small areas of North Africa. Pine trees growth reaches up to 3-80m in height. Pine trees bark is thick and scaly. 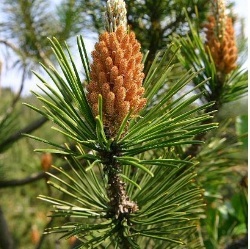 Turpentine oil is extracted from pine resin that is obtained by tapping trees of Pine by distillation. Turpentine oil is composed mainly of terpenes, mainly of monoterpenes alpha pinene and beta pinene with small amounts of careen, camphene, dipentene and terpinolene. Turpentine oil is colorless and clear liquid with a penetrating odor having warming sensation and a characteristic taste. It is flammable, water-immiscible liquid with a hot, disagreeable taste. Turpentine oil is used as a flavoring in food and beverages. It is used as a solvent or medicines in the pharmaceutical industry. It is used as ingredient in soap, cosmetics and also as paint solvent. It reduces the chest congestion and also useful to skin as it cause warmth and redness that provide relieve pain in the tissue underneath. It is used for many ailments such as muscle pain, nerve pain, sprains, cramps, cold sores and toothaches. It is used as a solvent or cleaning agent for paints and varnishes. It is used for treatment of disseminated sclerosis and sexual dysfunction. It is used in chemical industry as a raw material in making of insecticides, oil additives, synthetic pine oil, camphor and resins. It is also used as a rubber solvent in the manufacture of plastics. Use turpentine oil on the skin carefully as it can cause skin irritation. Internally use of turpentine oil can cause spasms of the airways especially in asthma and whooping cough person. Turpentine taken by mouth, can cause serious problems such as headache, sleeplessness, coughing, bleeding in the lungs, vomiting, kidney damage, brain damage, coma and death. Keep away from reach of children as they can die after swallowing it. Avoid use turpentine oil during pregnancy, it might cause a miscarriage. Description : A clear colorless to yellowish liquid, visibly free from water.